PROJECT ENGINEER: David M. Baker, P.E. During 2000-2002, ERD worked jointly with the City of Tallahassee to evaluate pollutant loadings discharging from watershed areas in the City of Tallahassee under current conditions and identify areas which have significant impacts on receiving waterbodies. 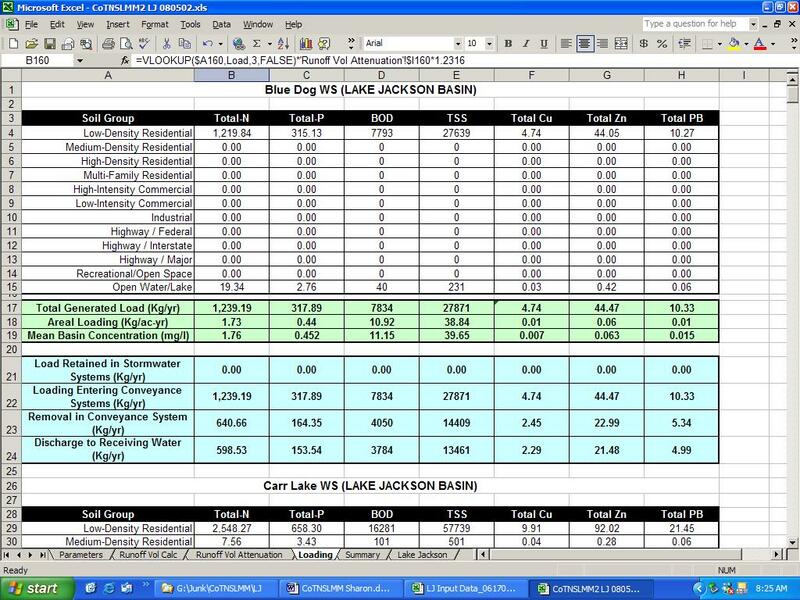 A GIS-based spreadsheet model was developed by ERD (CoTNSLMM) to identify the magnitude and major sources of stormwater pollutants affecting waters within the City of Tallahassee and to prioritize potential stormwater problem areas within selected watersheds for treatment. The CoTNSLMM model accepts GIS input of land use, soil types, and percentage imperviousness, and estimates total annual stormwater runoff volumes and pollutant loadings for multiple basins within a watershed. The model initially calculates the generated runoff value which is then routed through existing or proposed stormwater management systems and conveyance systems, resulting in an estimated runoff volume reaching a designated receiving waterbody. Stormwater characterization data is used to calculate estimates of the generated mass of pollutants, which is then attenuated through intermediate ponds, stormwater management systems, and conveyance mechanisms. The remaining mass is the estimate of loadings to the ultimate receiving waterbody. 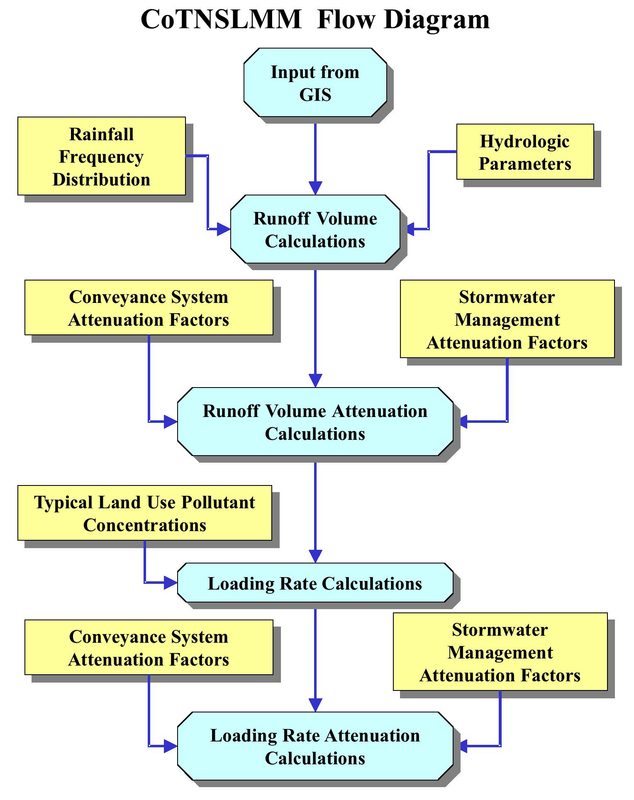 The model includes information on the types of stormwater management systems within each drainage basin area and assigns attenuation factors for both runoff volume and mass loadings based upon the type of stormwater management system used. A manual of model documentation, calibration, and verification was generated by ERD. This document provides a detailed discussion of the various components of the model, computational algorithms used, and instructions on data input. The model was calibrated based upon mixed land use characterization studies performed by the City of Tallahassee. The output from the model is used to rank annual and seasonal watershed pollutant loadings and to assist in identifying "hot spots"� within sub-basin areas.